There’s something about the silver screen that brings my family close together. Grabbing a kid’s movie and baking up the popcorn sets the tone for the four of us to have a great night in. It’s guaranteed to be stress-free time together, usually with a lot of laughs either from the movie or just from my kids making us crack up with their comments and questions. When grabbing movies from one of the nearby Redbox kiosks we usually pick up more than just one, opting to watch a second movie after the kids are asleep. I personally can’t get enough action, suspense and horror movies, while my husband is really into dramas…funny isn’t it? I guess that I really like the adrenaline rush that a move can provide, especially when based on a true story (or anything involving natural disasters). Well here’s a great tip for my fellow movie buffs. 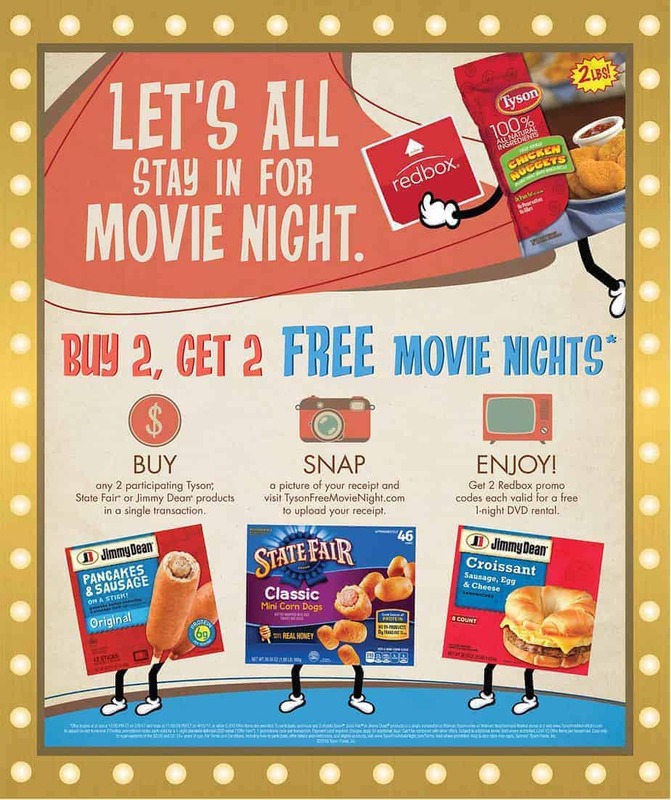 You can now get two free movie nights* with Tyson Products ‘Winter to Go’ offer by following the steps shown here: www.TysonFreeMovieNight.com. A simple few steps to free movie nights! It’s so easy as I’m always heading to Walmart anyway and oftentimes picking up these same featured Jimmy Dean®, State Fair®, and Tyson products. My kids can’t get enough of the Tyson chicken nuggets, and I’m a big fan of them being 100% all natural. It’s difficult finding win-win foods these days that get my stamp of approval and that my kids enjoy, so I’m glad Tyson comes through for me. We’ve been longtime fans of Tyson products for years, as well as Jimmy Dean tasty breakfast products. The State Fair mini corn dogs are something we discovered more recently and they too have become a staple in our home. My kids like them with ketchup and my husband and I with a little kick from hot sauce or our fancy mustard…yum! All of these products are also perfect for that aforementioned night in… easy, fun and tasty. – Tyson products must be purchased in a single transaction. *1 promotional code per transaction. Payment card required. Charges apply for additional days. Can’t be combined with other offers. Subject to additional terms. Void where prohibited. The New Dyson Supersonic Hair Dryer – Brilliant Innovation!